The date for the 3 weeks “FABO X” course (Course Number: FABOX-2018-S-1) is from July 23rd, 2018 to August 11th, 2018! It is an intimate and small class, so If you want to join, please hurry! 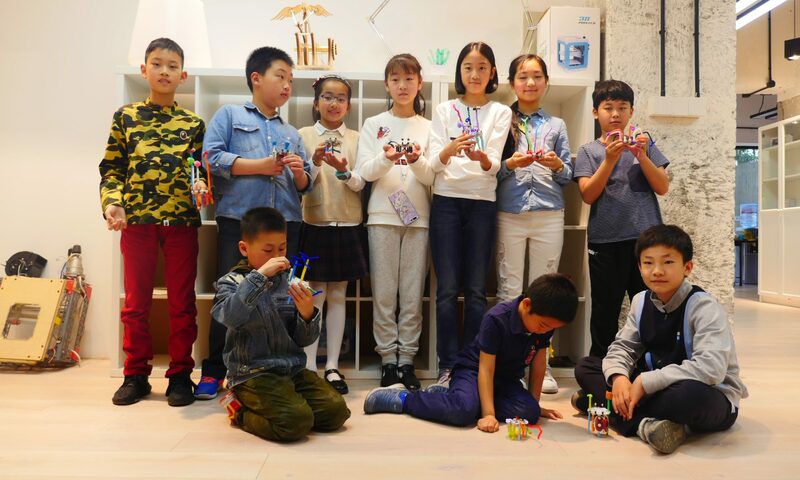 Zero Basic Learning！“FABO X” summer course developed by Fablab O is hot enrollment. These courses are for everyone, such as entrepreneurs, STEAM teachers, technicians and designers；It can help high school and college studentspresent high-quality portfolios and top overseas universitiesapplication, link seamlessly university graduates design worksto hardware entrepreneurship; Our organization will also provides high-payingjobs for the course graduates. A 17-year-old maker ,we call him “Gou Dan”, from the transliteration of his English name Gordon. He is very fond of hand making who has hosted a number of projects,such as open source 3d printer, gesture control man-machine and so on. Gou Dan participatedin many maker marathon competitions and also help Fablab hold source hardwareworkshops. Participated in 2015 “Pujiang Innovation Forum – Maker CultureSub Forum”he delivered a keynote speech and was interviewed by the CCTVdocumentary “The Chinese People’s Livelihood Act” – Season 2 episode- “I’ am a Maker” broadcasted on the CCTV News Channel on February 1,2017. Do you want to find new job in yourfuture and come to our summer program！One laboratoryof a famous university in Shanghai ,another one in Baoshan Creative Park willrecruit laboratory leaders required the graduates of the “IntelligentScholarship X” program of Tongji FABO; Requirement in a well-known intelligent robotcompany in Hangzhou is the same. In the era of “Mass entrepreneurship and innovation “, how tosuccessfully transform into the future demand for talent , how to get the biggestgold mine in the era of the Internet? The lack of intelligent hardware,programming or design basis, real-time courses in the university?To completethe hardware works (graduation design, high-quality portfolio), to achieveentrepreneurship (smart furniture, smart wearable, virtual reality…), to finda good job, join us Fablab O , the first Fablab laboratory in mainland China. FABO Academy X China, a parallel front-end course for MIT Fab Academy opened inChina, the three-week courses will take you deep learning in digitalmanufacturing and rapid prototyping techniques . Hands-on digital manufacturing tools ,and you will understand how to conceive works, shape your own ideas anddocument this process, and recommend work for you through the platform of our Fablab O. Find incubators for your product and capital docking! The principal for teaching is hands-on learning: keeping the theory short but dense before continuing on practical applications. This cycle will be repeated several time during the day. Each student is required to bring his own laptop, in good working order, with a mouse and basic softwares installed. These examples show the great results our student achieve during the three weeks of the class. It is not only a course that teaches new skills, but also a full immersion experience where students learn how to envision their ideas and make them real. 2D Design software, design and Laser Cut your name tag. 3D Modeling software, design and 3D Print a 3D model. CNC Milling, Molding & Casting: mill a mold and cast a gypsum copy. Electronic Design: soldering your first PCB, electronic components overview. Programming: add Input & Output devices to your PCB. 3D Scanning: scan, modify, print and animate yourself. Design Thinking: how to make an Invention. Research, Brainstorming and Design. Final Project: design and manufacture a prototype. Classes will take place every Monday, Wednesday and Friday at 9.00AM in the Fablab. Tuesday, Thursday and Saturday the students come to the Fablab and work on the daily assignment. The instructor will be present to answer questions and to help. Learn the basics of 2D Graphic and 3D Modeling software and start training on laser cutting and 3D printing. Understand the constraints and best practices to design objects for digital fabrication tools. Get used to move from design to prototype and back for improvements. CLASS 1. 2D DESIGN SOFTWARE, DESIGN AND LASER CUT YOUR NAME TAG. Introduction to the basic commands of a 2Ddesign software. Learning key concepts of designing 2D objects and understand the possibilities and limitations of laser cutting. Design a multi-part name tag with engraved and scored element and press fit joints. Laser cut your name tag and assemble it without using glue. Analyze the parts and modify the model, cut an improved version. Learn the basic commands of 2D Graphic software. Know what kerf is and how to compensate for it in the design. Learn how to safely and efficiently use the Laser Cutter and the stock material. An introduction to the basic commands of a 3D modeling software and to the different 3D printing technologies. Learn the limitations of what can be printed and the workflow going from design to print. Analyze and debug printer errors. Design thinking, quickly going from idea to design to 3D printed prototype and then back to design. Design a small 3D model and use it for testing the printer and its design rules. Design and print something that could not be laser cut. Analyze your print and modify the model, printan improved version. Learn the basic operations of 3D Modeling software. Learn the tool chain and workflow for 3Dprinting. Identify and solve printer errors. Apply design thinking to rapid prototyping. Teaching the fundamentals of milling using the Roland milling machine to create 3D parts. Design a 3D surface, generate toolpaths and mill a negative mold of the model. Use casting techniques to make a concrete copy. Design a model that comply with the design rules of the machine and tools used. Mill a negative mold in foam. Cast a copy using concrete. Understand the workflow used in milling a 3D part. Design objects within the limitations of three axis machining. Experience the production of concrete parts from digital shapes. A broad view on digital manufacturing techniques and guided project development using 3D scanning, electronic design and programming. Understanding how the machines work, what they are used for and what are the materials available. Understand how to adapt the design process to the machine or technique used. Introducing design and programming techniques for electronics. Introduction to electronic circuits and electronic components. Learn the basics of soldering with the “Shanghaino” kit, a simplified Arduino clone, and understand how it works. Introduction to the Arduino IDE development environment. Upload and test the first program. Make a list of the Shanghaino’s components and specify what they are used for. Solder all the components on the PCB. Connect it to the computer and upload a test program with Arduino IDE. Understand the functions of electronic components. Understand the workflow of uploading a program on the PCB. CLASS 5. ELECTRONIC DESIGN: MAKE A DEVICE WITH INPUT & OUTPUT. Elaborate a final project proposal based on the research conducted in week-one. Learning how analog and digital ports work and how to add Input and Output (I/O) devices to the microcontroller. Make a prototype circuit using the Shanghaino PCB and I/O devices, write or modify a program and test it. Discuss with the class a final project proposal with I/O capabilities. Use the Arduino IDE to write or modify a program with I/O devices. Assemble your circuit on a breadboard and test it. Analyze a question and prototype a solution. Conduct simultaneous hardware and software development. Work with electronic components on the breadboard. Learn how to digitize the physical world usingthe 3D scanner. Learn how to modify and repair a 3D scan model. Practice moreon a 3D Modeling software and use it to modify the file. Add a servo motor toyour model, print it and make one part move! Scan yourself with a 3D Scannerand repair the mesh. Modify the model and add a servomotor for a moving part. Print the model and check theresult. Understand the advantages and limitations of 3DScanning. Learn the basic operations of 3D Modelingsoftware. Understand the difference between mesh andNURBS polysurface. Discuss with the class a final project proposalwith input and output capabilities using design thinking techniques. Overviewof input and output devices, how to connect them to the Shanghaino and how towrite a program to use them. Make a prototype of the final project, write ormodify a program to make it work. Complete the documentation and present thefinal project to the class. CLASS 7. DESIGNTHINKING: HOW TO MAKE AN INVENTION. To begin designing the final project thestudents will be introduced to Design Thinking techniques. First they willconduct a research about the field their product will live in, make abrainstorming and move to the design stage. At this point they will experiencehow rapid prototyping works, by moving many times back and forth in both thedesign and fabrication stage. Make a research about the final project idea. Make a Brainstorming to find ideas. Understand design thinking and spiraldevelopment. Identify mistakes and fix them. CLASS 8. FINALPROJECT: DESIGN AND MANUFACTURE A PROTOTYPE. Design and fabricate a final productthat integrates electronics, functions and shapes. Learn the basic of spiraldevelopment. Use as many techniques learnt: 3d printing, 3D scanning, lasercutting, CNC milling, molding & casting. Test the electronic circuit and the program. Design and fabricate all the parts of yourproject. Assemble your project, test it, modify, improve(use spiral development). Understand system integration, materials andprocesses needed. Manage time, break down developmentin simple tasks, iterate, add features. Solve problems and deliver solutions in a shortamount of time. CLASS 9. FINALDOCUMENTATION & PRESENTATION. Finish the final project and complete thedocumentation website. Review your work and present your website and yourproject to the class. Complete all the work and the documentation. Present your work to the class. Be able to talk in public and make an effectiveexposition of the work. Fab Academy is a Digital Fabrication program directed by Neil Gershenfeld of MIT’s Center For Bits and Atoms and based on MIT’s rapid prototyping course, MAS 863: How to Make (Almost) Anything. It offers a 5 month program on digital fabrication, and it could be taken in any of the participating labs.